Ever since I posted the quick and simple healthier eating recipes, I’ve been more aware and conscious of my eating habits and have been trying to choose healthier options from snacks (like gently baked strawberries and sweetened with apple juice instead of sugar from Urban Fruit) to meals (as much as possible, use fresh ingredients without added condiments like soy sauce salt, or oil. One of my favourite things to cook are Asian dishes, because let’s face it, when you’ve been raised and grew up eating Asian food, you’ll need to satisfy the craving occasionally. 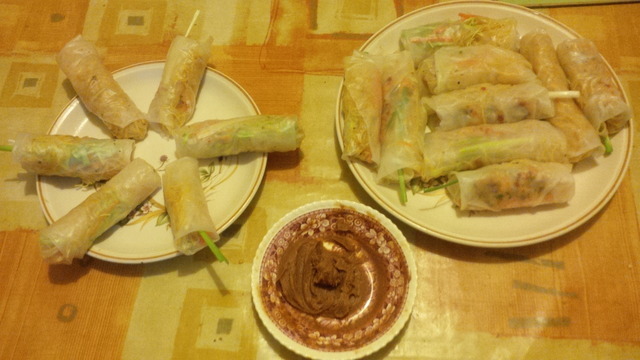 One of my favourite things to make that is fresh and doesn’t involve deep or shallow frying, or oil-inducing methods of cooking, are Vietnamese summer rolls or gỏi cuốn. It might still be somewhat chilly here in Edinburgh, but the freshness of the vegetables makes it a good summer dish to enjoy. This is normally served as an appetiser and is served cold, never hot. This would defeat the purpose of keeping all its ingredients fresh. The reason it’s called a ‘summer roll’ is because when it comes to the heat in Asian countries, dishes are served to help people cope with the intense heat. For example, you get tom yum goong (or hot and sour soup) in Thailand as the heat/spiciness from the soup helps lower your body temperature. 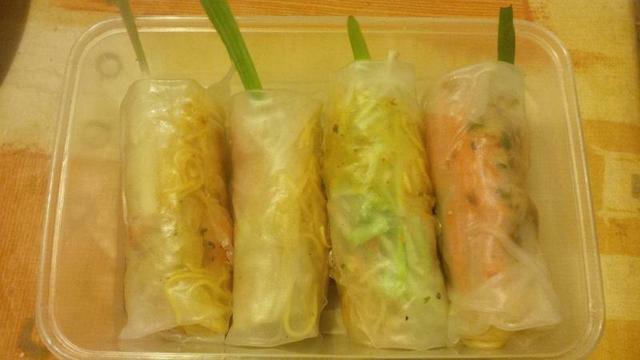 In Vietnam, the freshness of the rolls and raw vegetables serve the same purpose. Gỏi cuốn is usually made with fresh, raw vegetable cut into thin small slices/batons and your choice of cold cooked chicken or prawns and served with a non-spicy peanut sauce. 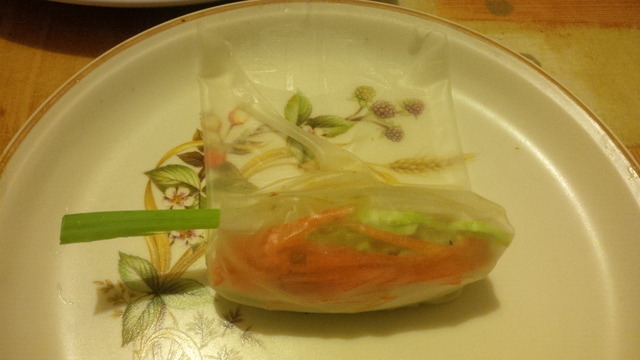 When I passed by Real Foods recently and came across the rice spring roll wraps that I couldn’t get at my local Tesco Extra, I couldn’t wait to make my own gỏi cuốn to enjoy in the comforts of my own home. 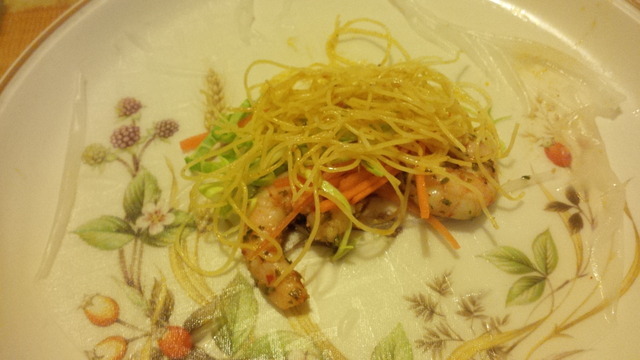 By the time I got off work though and went to the shops to get the ingredients we needed, it was already 8:45pm so I decided to switch it up a little by making spicy gỏi cuốn instead using coriander and chilli prawns with Singapore style vermicelli noodles. For those who want to try to make traditional gỏi cuốn, you can still use the recipe below, but instead of getting the chilli prawns and vermicelli noodles, just use the plain/non-seasoned variety. 1. Make sure your vegetables are already chopped and ready for wrapping. To get the rice wrappers ready will only take 10 seconds, so you need to be prepared! 2. If you bought fresh/raw prawns, make sure these are cooked, peeled and left to cool before moving on. To make the most of your prawns, butterfly your prawns in half. This will leave you with plenty of prawns for your rolls, otherwise you’ll find yourself running out too quickly! 3. If you bought dried vermicelli to cook at home, bring to boil a pan of water and cook the noodles (approx. 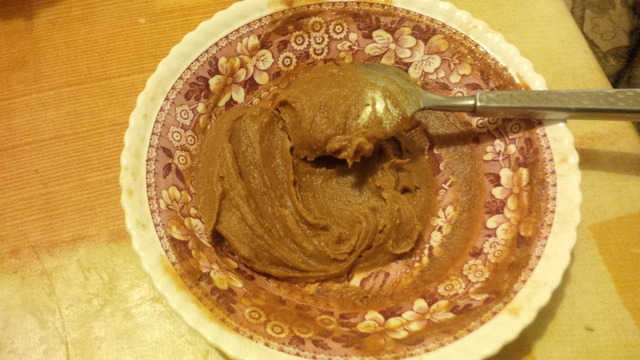 500g) for a few minutes and leave to cool in a bath of cold water. Drain the water when you’re ready to start wrapping. 6. Now fold the left and right sides over your filling (3 and 9 o’clock). 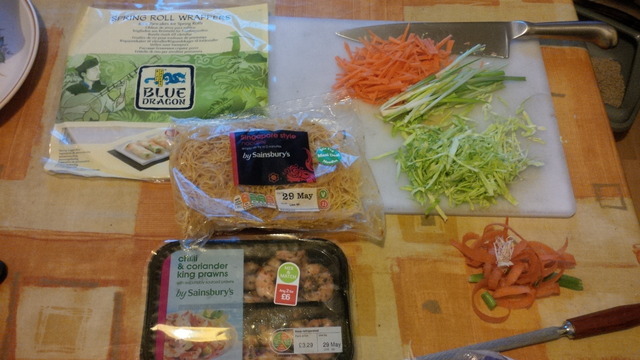 Then fold the top edge (6 o’clock) over and put a sliced spring onion on top. 7. Holding onto the top edge of the wrap with your thumb and your fingers on the covered filling, gently but firmly roll the wrap away from you. The glutinuous consistency of the wrap will hold everything together, don’t worry about your filling falling out! That’s the important part of putting your filling quite close to the top and not in the middle! 8. 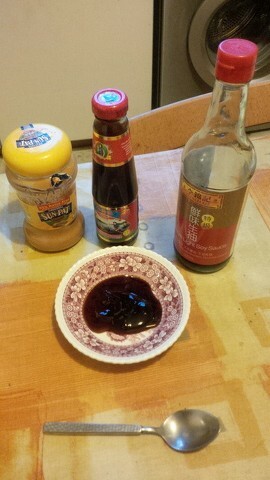 Mix the soy sauce and the oyster/hoi sin sauce together in a small sauce dish. 10. 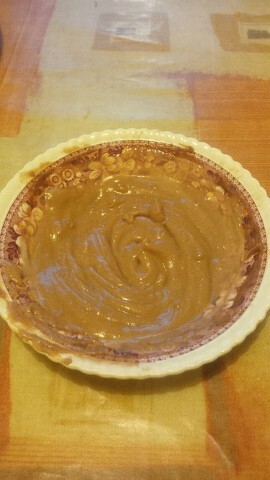 Add the water to the peanut butter mix until it’s at a good consistency for dipping. This had the right about of peanut butter for me, but if you want, feel free to add a bit more peanut butter and add a bit more water to make it easier for dipping. 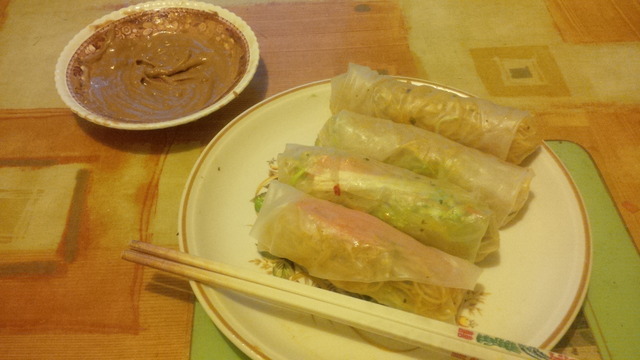 Now present your gỏi cuốn and peanut sauce to family, friends or guests and enjoy! If you’re not a big fan (or have an intolerance) to spicy food like I do (I can now take a small amount of chilli, but anything too spicy causes my tongue to burn and continued consumption can cause stomach pains! 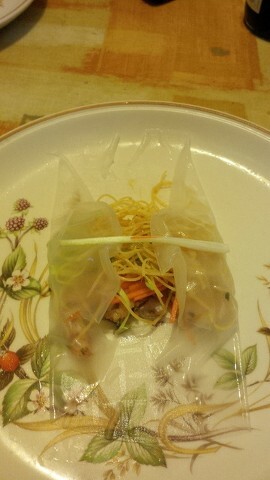 ), go with the traditional and fresh rolls. It’s meant to be enjoyed as a refreshing dish to help lower your body temperature to cool you down with the summer heat. If you like a small bit of spiciness, the chilli and coriander prawns and Singapore style vermicelli noodles from Sainsbury weren’t too spicy, but there’s always the option of just getting spicy prawns or vermicelli instead of getting both in the spiced variety. I’m always keen to share recipes from Asian cuisines because I love how healthy and different it is to Western or European cuisines. Almost all countries use oil in their food, whethr it’s fried or cooked with a dash of oil, you just can’t avoid it. With quite a lot of Asian dishes though, it’s either steamed or boiled, so you’re consuming quite a bit of water through your food and it’s a healthier method of cooking. I admit that there are also dishes that require deep or shallow frying, especially with Western influences introducing fusion cooking in Asian countries, but to keep to the tasty traditions of Asian home cooking, boiling and steaming if you’re not eating it fresh is the way to go. Have you made your own gỏi cuốn at home? If you changed some of the ingredients, what did you alternate it with?